I'm missing photos of Putney Bridge (a five span, masonry deck arch), Wandsworth Bridge (a haunched steel girder), and Cremorne Bridge ( a five span, steel deck arch) so we'll go to the next arch bridge downstream, which is the Battersea Bridge. Like most Thames crossings, the present bridge replaced an earlier timber structure built in 1771. It was immortalized in paintings by J. M. W. Turner and J. M. Whistler. The old bridge was bought by the Metropolitan Board of Works (MWB), who promptly replaced it in 1890 with a new structure designed by Joseph Bazalgette. The river has become broader as we've moved downstream, and so this bridge required five arch spans to cross the river. Granite piers and abutments support cast-iron arch ribs braced with wrought-iron cross-members. The bridge is painted green, with golden inset decorations, an intricate ballustrade, and tall lamp posts supporting three lights. It is 413 ft (126 m) long and 55 ft (17 m) wide and carries vehicles and pedestrians. This is an interesting area of London. Roman weaponry was found when the banks for the first bridge were being excavated. 'Battersea' comes from the name of an ancient chief who resided here, perhaps 1500 years ago when the Thames was a marshland. Later, the marsh was drained and this area became rich farmland. In the 19th century Cremorne Gardens was built and provided entertainment where a power station now stands. The bridge was designated a protected structure in 1983. In 2005 a barge became stuck under one of the arches and damaged the bridge. It was closed for several months while repairs were made. 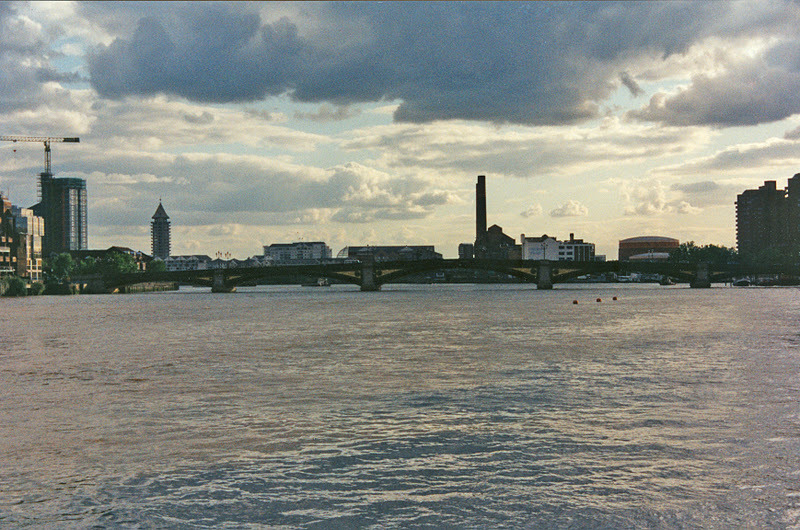 Thames River Bridges: Battersea Bridge by Mark Yashinsky is licensed under a Creative Commons Attribution-NonCommercial-ShareAlike 3.0 United States License.